The 17th Edition of Young Leaders Conference 2018 School of Leadership is now receiving the application forms from the talented and energetic candidates. The conference will be managed in Lahore from 1st July 2018 to 6th July 2018. This is the dream of Pakistanis Youth to know their potential and it gives the vision to the young leaders conference to start its working. There are over 300 participants from across the country and the young leader conference offers the refreshing and engaging the experience. You need to join us with the ground breaking, pioneering and this conference will help you to realize the real power of you. You should join us in the Young Leadership program. This is the time to finally transform and emerge as the leader you truly are. Sunday to Friday (July 1st – July 6th 2018). 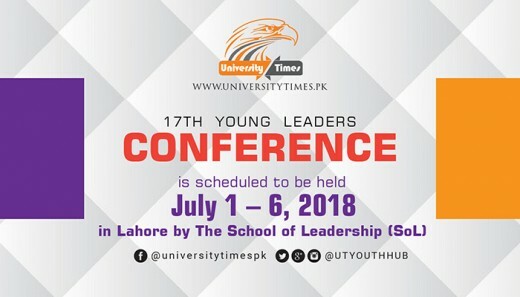 For last 16 years, every single young leaders conference has been conducted with theme, unique and it has inspired every participant, who attended this conference. The theme of the conference of this year is ‘It’s is time’. We sure that most of the students will want to know their capacities. They will dream bigger than ever and it is time to spark the flame and ignite the fighter, which is hidden inside them. We promise you that you will feel a different person after the completion of the youth leader conference from the person, when you entered in it. You will have a new perception of life and you will be able to accept any challenge, which will be offered to you. You should be determined, confident and inspired and you will be able to bring a new change and you think it would not be possible before. You will learn a lot at the YLC. YLC is for the youth aged program having the age between 18-24. Bring along your valid CNIC or Passport to support the same. A completed YLC application form is required. A constructive & resilient attitude. YLC is the inclusive event and goes far to ensure accessibility for participants with different learning abilities. YLC Alumni from any year are not eligible to apply for this conference. YLC Team will select the participants, who have a passion to learn, a desire to excel & a love for sharing.